Work never stops to make life better for the children at the Tender Sprout home at its temporary base in Kilinochchi in Sri Lanka. It was set up by a group of brave women who were appalled by what Sri Lanka's 20-year civil war was doing to children. 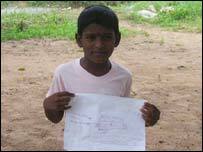 Until 26 December 2004, the day of the tsunami, the Tender Sprout home was in Mullaitivu, on the coast. Some 3,000 people in the fishing village of 5,000 died. The staff protected the children from the war. But they could not protect them from the Tsunami. When the waters receded they found 30 bodies. 93 others are missing from the children's home, presumed killed. 52 children survived. At night, the home's staff watch over the children with hurricane lamps. There is no electricity. They stand ready to soothe away the nightmares that trouble their sleep. No wonder they dream. They saw everything. Kilinochchi is inland, 40 miles from Mullaitivu. Every morning the women who care for the children try to create a routine, to make their lives feel predictable and safe. They supervise washing, teeth-cleaning, then exercise and prayers. But it is hard - because these children have never felt safe. Before the tsunami, in Sri Lanka's 20 year civil war, they all saw shelling and killing, lost their homes and at least one parent. The children have been told that the grown-ups are still trying to find their 93 missing friends. I met three girls who survived because they were inside covering new exercise books when the wave came. It is impossible to keep so much death a secret from them. Selvi, 12 years old, knows her brother is dead. She was told by her mother, who cannot care for her because she suffered a mental collapse during the war. Shanthini, 13, dreams of waves and wakes up screaming. She went through trailers full of bodies looking for her two younger sisters. She's trying to believe that they'll come back. Susi, who is nine, thinks her little sister died on the way to hospital. But she is not certain. When the waves went down she saw her alive - and they never showed her a body. The children used to have birthday parties on Mullaitivu beach. They are a long way from it now, but remembering the way the ocean roared a month ago terrifies them. You can hear the surf at the centre where they lived. It was built near the water, so the children could play and swim. It is a wreck, and they are not coming back. They are rebuilding inland, for the survivors and 300 other children made destitute by the tsunami. Mullaitivu is dead, rotting in the monsoon. The people have gone. Even the palm trees are dying. Their roots were poisoned by the Tsunami's salt. It is hard for parents too. When Sinnathurai Thavarajah, a fisherman, searched through the ruins of his house all he found was an old toy tennis racket, which he gave to his son Danush, who is five. He rescued the boy but could not hold on to his wife and two-year-old daughter. He won't rebuild the house where it is. He is hoping the Tamil Tiger authorities who control this part of Sri Lanka will build houses at least 400m inland. But he realises that the only way he can provide for Danush and two older children is to go back to sea. "I'm alive," he told me, "but I feel dead." Death is everywhere. At the children's home, five-year-old Sinthuja points out half a dozen of her friends, who are in a photo on their annual calendar. The little girls were all under five, and they are all dead. Niranjana, 13 years old, a war orphan, loved the little dead girls as the sisters she never had. She is tormented by the moment when the wave took one of them, a three-year-old called Arabi, out of her arms. "When the water went down I looked for her. She was lying on the floor and she was dead. I carried her to the hospital." In her picture of what happened she is watching Arabi being swept away. She drew it for her counsellor. Unicef says every child who went through the Tsunami has suffered psychological damage. 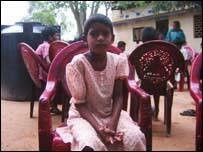 Niranjana's counsellors say that all the children here could do with much more help - but they worry most about her. She won't talk much. She sits down with a dozen other girls for a session with their counsellor. "If you tell me more I can help you," he said. "They've gone away from us," was all she would say. He asked her when she felt most sad. "When I'm alone, and asleep." "Don't tell her to stop crying," he told a friend who was trying to console her. "Let her grieve."